Deal with included $4.00 OFF Coupon! Tampax Radiant regular plastic tampons give you the confidence and freedom of up to 100% leak & odor-free protection. Our quietest tampon wrappers are fierce, fun-patterned, and re-sealable! 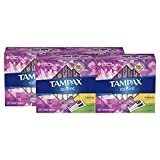 Tampax Radiant tampons have a CleanGrip applicator designed for incredible comfort and a LeakGuard Braid that helps stop leaks before they happen. So don’t let a little thing like your period stop you from living life to the fullest.